When the zombies come, nobody’s going to save you but yourself. This idea has zombie apocalypse survivalists designing amazingly complex safe houses from compact extending shells you can carry on your back to entire fortified neighborhoods complete with electrified lawns and zip lines. 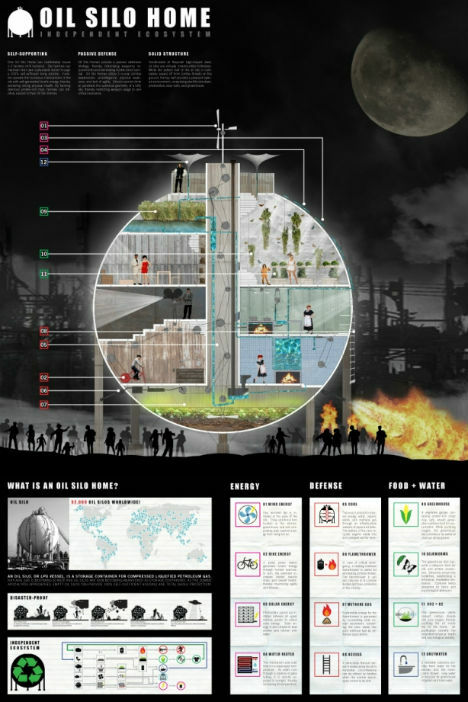 Architects Southwest sponsored this year’s ‘Zombie Safe House’ competition, and these top 12 winning designs might just prompt you to think about how well you’d do in your own home. 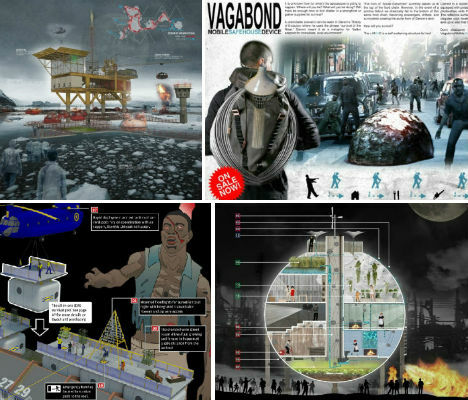 Check out the remaining 5 finalists and the rest of the entries at ZombieSafeHouse.wordpress.com. Snagging the 1st place ‘Gold Shovel Award’, the Vagabond Mobile SafeHouse Device is a self-sustaining structure for two that can be carried on your back in a stylish rucksack. Containing potable water filtration systems, a tracking device and photovoltaic cells that form a tough skin, the shelter folds out into an instant protective shell that can be set up in less than three minutes. 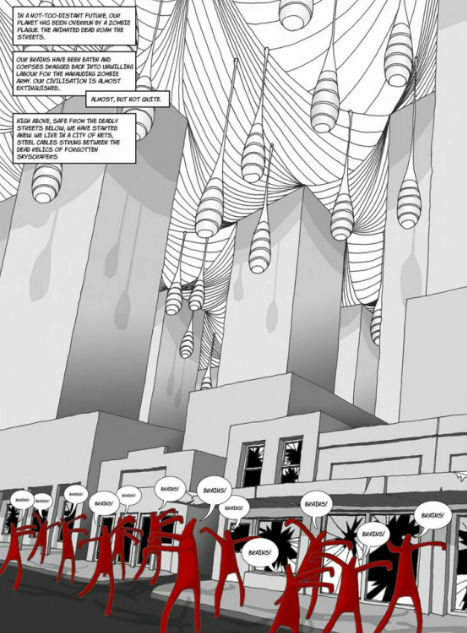 Creator ‘snd’ predicts that in a zombie apocalypse, only those who adapt immediately will survive a la Social Darwinism. “Don’t disappoint Charles Darwin, get your own Vagabond Mobile SafeHouse Device today.” If only. The 2nd place ‘Silver Machete Award’ goes to the Oil Silo Home by PinkCloud.DK. 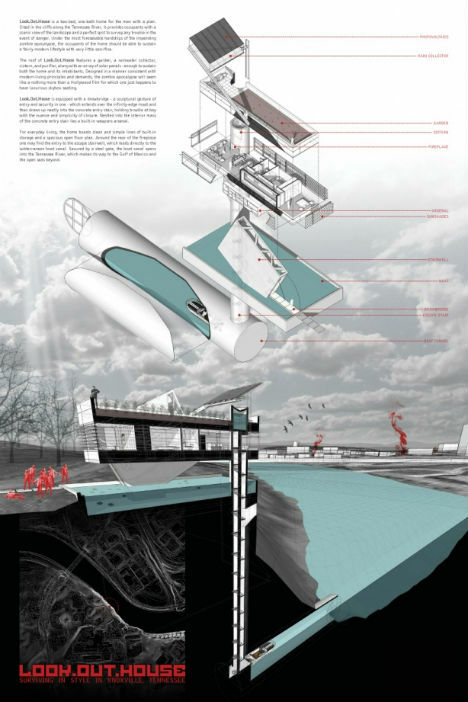 This self-supporting design makes use of the 52,000 oil silos that already exist worldwide. 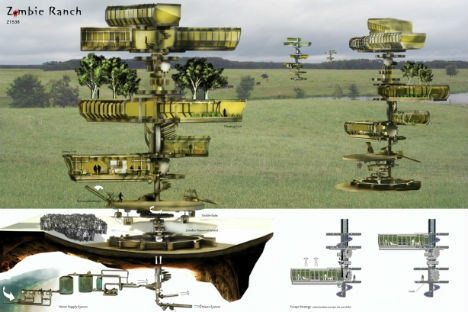 Disaster-proof, these structures can provide an ‘independent ecosystem’ when equipped with wind, solar and bike energy as well as a greenhouse, silkworms for fabric and greywater recycling. The best part of the Oil Silo Home is its ‘passive defense’ design, which uses existing oil and methane gas as weapons against invading zombies. When faced with the worst-case scenario, who wouldn’t want a stylish modern home that is eminently livable yet also practical for survival? The Look.Out.House is imagined for a riverfront location that provides a scenic view of the landscape and an ideal vantage point to watch for zombie invaders. It includes a rooftop garden with a rainwater collector, cistern and purifier, solar panels and a lovely open floor plan. Major advantages include a drawbridge extending over an infinity-edge moat, a built-in weapons arsenal and a subterranean boat canal leading to the river. Need to ‘bug in’ – meaning, stay at home rather than trying to flee to safer locales? You’d better make sure your house is as zombie-proof as can be. This plan by Jordan Lloyd and Roger Cooper outlines each step you must take to equip your existing home with zombie-defending features that could be sold in big box stores like IKEA. Suggestions include biodiesel for power, a ground source heat pump that can electrocute any zombies in your yard, a helipad for rapid armed forces counter assault, large rainwater tanks and zip wires that allow residents to quickly move to other streets without descending to ground level. Not only would you be living the high life at the Honorable Mention-winning Zombie Ranch – literally – the very brain-seeking creatures that are out to destroy you would help power it. Drawn to visible baits, zombies turn a giant wheel in order to get to them. Thankfully, they’re not quite smart enough to see how they’re being used (or are they?) The unit has a retractible bridge so that occupants can get in and out, and includes space to grow food as well as living units. “High above, safe from the deadly streets below, we have started anew. 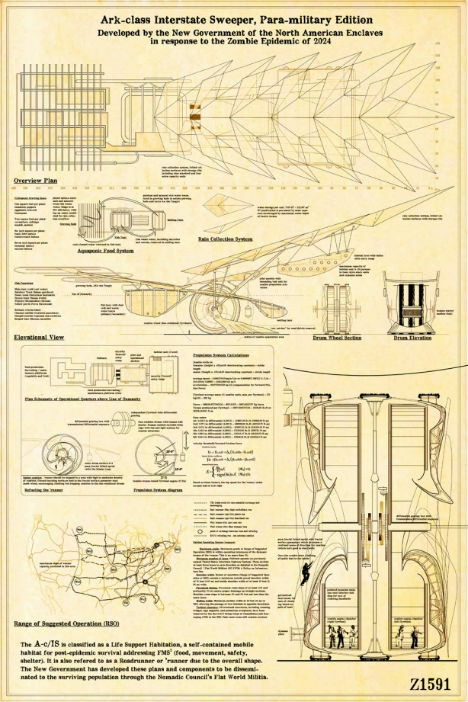 We live in a city of nets, steel cables strung between the dead relics of forgotten skyscrapers.” This is how contest entrants Mihaly Slocombe Architects envisions surviving the zombie apocalypse – in hanging pods packed with rations and weapons, offering excellent visibility of the carnage below. Draped between parallel strands of the nets are plastic membranes, which support the various industries and functions needed for survival including rain capture and growing food. 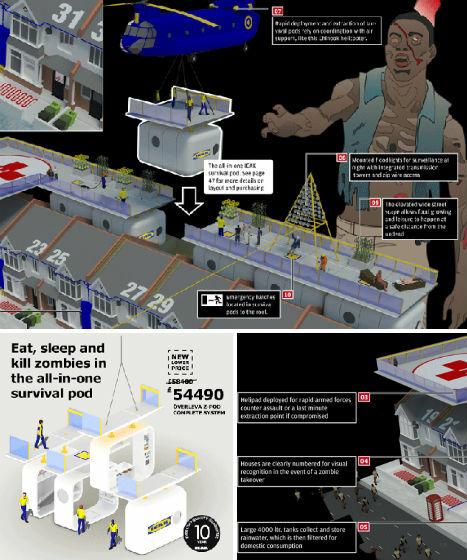 Just as we have public shelters for natural disasters, this entry imagines giving each local area its own zombie survival shelter. 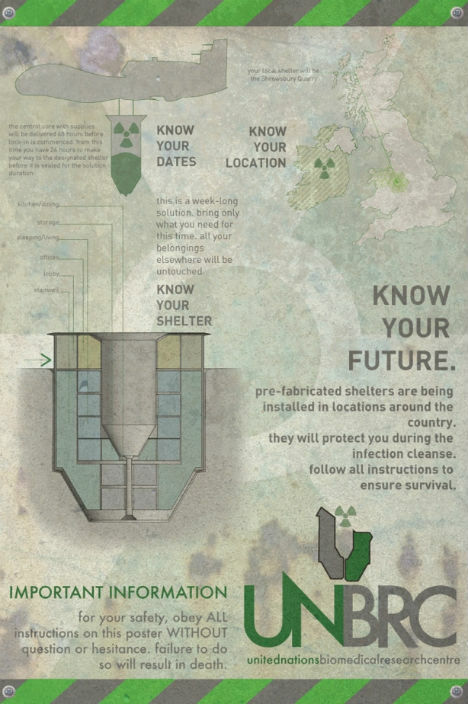 Located underground, the shelter will enable those not yet infected to get to a safe place and be sealed inside with all the supplies needed to live “during the infection cleanse.” You hang out underground for a while, and when you come back up, the zombies are gone. Hard to argue with that. On the other hand, if there’s a zombie outbreak, it would be nice if the shelter could come to you. 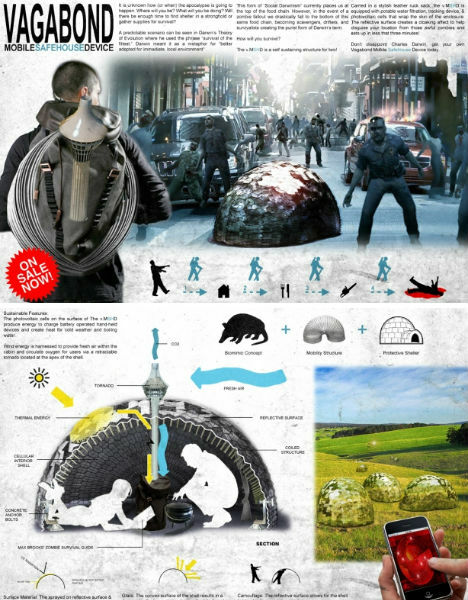 Yet another Honorable Mention entry, the ZeRAD – Zombie Emergency Rapid Deployment Shelter – gives humanity one last chance to survive. Helicopter-deployed mobile modules with penetrator spikes heavier than the spheres are dropped to the ground. The spikes secure them so they can withstand a heavy assault. 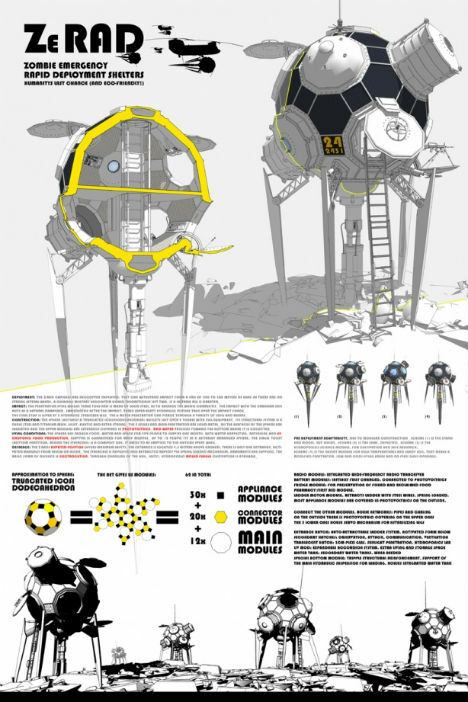 Each sphere has enough food, water and space for five people to survive for one month, with additional water harvesting capabilities. And if any zombies try to climb up, they’ll be fried by the electrified hull. Imagine a zombie-infested future where the outbreak is so bad, we can’t even live on land anymore. If it gets to that point, LIFEBUOY has us covered. 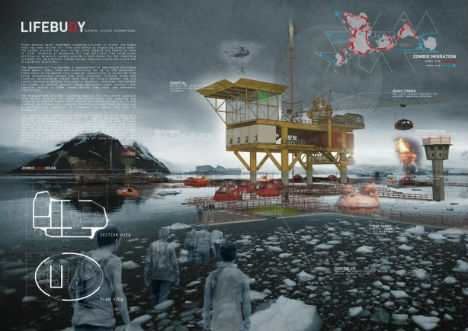 This design makes use of abandoned oil rigs, turning them into entire floating complexes that include crop fields, radio towers, markets, food storage and a hospital. Each rig can support 500 survivors. The Statue of Liberty has long been one of the first sights glimpsed by immigrants into America, and one day, it could literally offer a safe haven of survival. 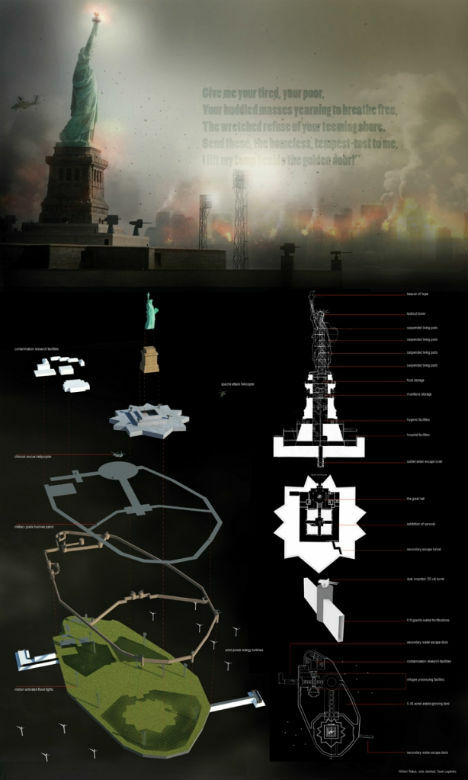 The torch becomes a ‘beacon of hope’, while the rest of the statue includes a lookout point, living pods and storage space for food and munitions. 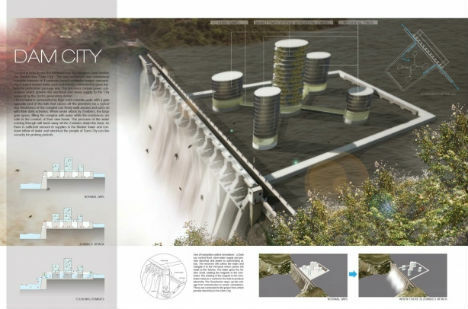 Again taking advantage of the fact that zombies (theoretically) can’t swim or float, Dam City places a new civilization across the Krishna River in India at the Srisailam Dam. Using the existing dam as a base, the civilization adds four concrete residential towers surrounding a central market tower. Each tower is connected with glass tunnels for pedestrians, and the dam provides the power. When under attack, the dam gate opens, filling the complex with water to wash the zombies down the side of the dam. Not only is this ‘Ark’ just what it implies, with enough space, supplies and technology to support what uninfected humans may remain, it also sweeps zombies right out of the streets as it moves. Features include an aquaponic food system and rain collection system. The Ark moves along the interstates to locate and save survivors.